Rising cost of accommodation and children’s education are among primary reasons that seem to have kept the UAE from rising in position in this year’s HSBC rankings of hottest expat destinations. The UAE has been ranked No. 15 overall in the Expat Explorer 2015 survey conducted by HSBC (same as last year), but behind GCC peer Bahrain (ranked at No. 5 this year) and also behind Qatar and Oman (ranked at No. 13 and 14, respectively). HSBC says its Expat Explorer ranks 34 countries using a score that summarises expats’ overall impression of the different countries. The overall score is the average of the Expat Economics, Expat Experience and Raising Children Abroad scores, covering 43 different criteria from the survey. The survey, however, notes that the UAE is a “great option” for career-focused expats who also enjoy a high quality of living, and is an extremely safe place for raising children. “The United Arab Emirates emerges from this year’s survey as a great option for career-minded expats looking for a high quality of life, securing a solid score from expats across all criteria, but particularly for Expat Economics where it ranks 10th out of 34 countries,” says the survey. The main attraction for expats to move to the UAE appears to be the career opportunities, with 60 per cent of expats believing that the move will improve their job prospects, well above the global average of 38 per cent. In addition, more than a third (37 per cent) state their main motivation for moving was to pursue a higher quality of life, and over half (54 per cent) agree that this is something they continue to associate with life there after they arrive. Among the beneﬁts reported by UAE expats include higher salaries (58 per cent compared to a global average of 40 per cent), a better car (55 per cent), higher quality accommodation (39 per cent), and domestic help (23 per cent), all of which exceed the global averages of 31, 29, and 20 per cent, respectively. 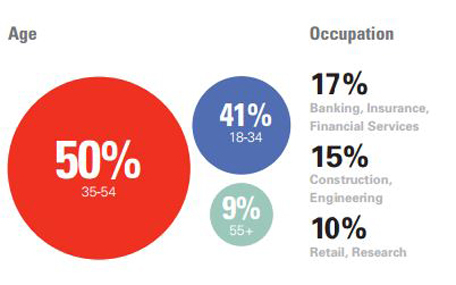 “A signiﬁcant number of expats move to the Middle East looking for better job prospects and to boost their income. Indeed, the countries where expats are most likely to move abroad for these reasons are all in the Middle East,” it notes. 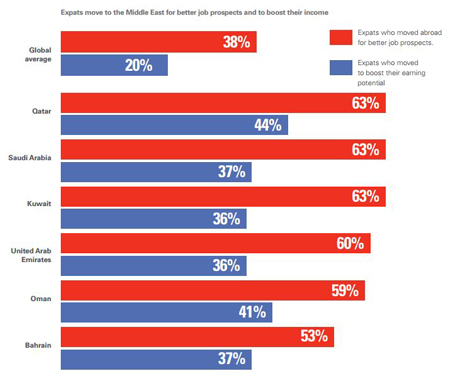 “These promising career prospects seem to be a reality, as over three-quarters (76 per cent) of expats in the region are in full-time employment and 70 per cent of those living in the region believe that they earn more than they would have in their home country (compared with the global average of 53 per cent),” the survey adds. The UAE scores well on expat satisfaction with their host economy, ranking No. 10 in the world on the parameter, but the country emerges as one of the costlier expat destinations ranked by the survey, with more than half of UAE-based expat respondents saying that they would choose to leave because it is too expensive (60 per cent) or for retirement (23 per cent). Expats report that a lot of things such as utilities (58 per cent) and household goods (53 per cent) cost more than they did at home. “Although nearly six in 10 (58 per cent) expats there say that they have more disposable income than they did at home, this is only just above the global average of 53 per cent, underlining the fact that it is far from cheap, particularly in comparison to more cost-effective options like Vietnam (75 per cent) and Thailand (72 per cent),” the survey notes. Work and income emerge as major drivers for expats living in the UAE, but it also appears that it may not be all about the money. Expats also comment on the pleasant working conditions and enjoyable travel to and from their jobs. Well over half say that their work commute is better than it was at home (59 per cent compared with a global average of 45 per cent) and a greater proportion says that they feel welcome at work, matching the global average of 66 per cent. The Purchasing Manager’s Index continues to show good growth for the UAE – which may prove a further draw for expats from around the world in the future. Expats there also associate the country with higher personal security (66 per cent compared to 42 per cent average). 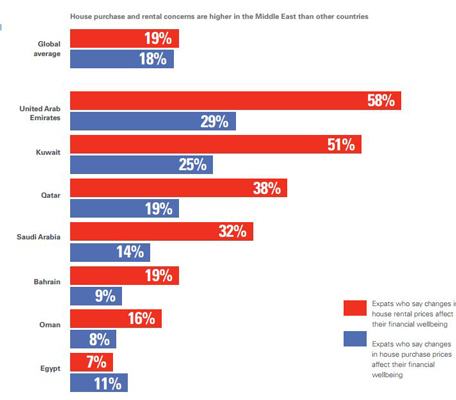 Rental rates and volatile house prices are a big concern among expats in the Middle East, the survey notes. These concerns are prevalent among expats across the region, but are much more prominent among those in the UAE, according to survey stats. As many as 44 per cent of expats in the region say ﬂuctuations in rental prices pose a risk to their ﬁnancial wellbeing – more than twice as many as the global average of 19 per cent. Within the Middle East, UAE-based expats are most likely (58 per cent) to cite changes in rental prices as a threat to their ﬁnancial wealth and the sentiment is echoed among expats in Kuwait (51 per cent) and Qatar (38 per cent). In fact, the survey refers to last year’s guidance from the International Monetary Fund (IMF), calling for places like Dubai to introduce further measures to cool the demand for property in the emirate, which grew at the fastest pace in the world in 2013. “Looking at the regional picture, over a ﬁfth (22 per cent) of expats in the Middle East say changes in house prices pose the greatest threat to their ﬁnancial well-being with those in UAE (29 per cent), Kuwait (25 per cent) and Qatar (19 per cent) being the most likely to share these concerns,” it notes. This is cited as one of the reasons why most expats see a stint in the Middle East as temporary, and not many plan to settle down here, especially post-retirement. “For most expats, a move to the Middle East is a short-term venture, not an opportunity to settle down,” the survey states. “Expats currently living in the Middle East are more likely to consider moving away for retirement reasons than their counterparts in Europe and Asia – over a ﬁfth (21 per cent) are considering doing so, compared to 17 and 18 per cent in Europe and Asia, respectively,” it highlights. “Bahrain ranks second out of 34 countries in the Expat Experience league table, scoring particularly well for quality of life and performing better than its Middle Eastern counterparts, Oman (#19), UAE (#21), Qatar (#28), Saudi Arabia (#32), Kuwait (#33) and Egypt (#34),” the survey notes. It adds that expats looking for a better work/life balance will enjoy what Bahrain has to offer – active social life and a better working culture and environment (47 per cent compared with the regional average of 43 per cent and global average of 39 per cent). More than six in 10 expats in Bahrain (62 per cent) say they have a better work / life balance than in their home country (compared with the Middle East average of 44 per cent and the global average of 40per cent). In addition, more than half of expats in Bahrain maintain they have better accommodation (55 per cent) and a better commute to work (68 per cent) since relocation – the highest out of all Middle Eastern countries where regional averages are 40 and 54 per cent, respectively and higher than the global averages of 40 and 45 per cent, respectively.